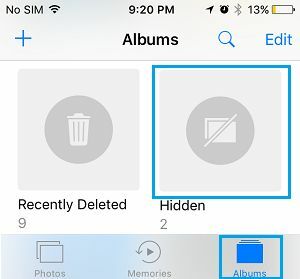 In case you have some photos on your iPhone that you do not want anyone to see, you can either hide them using the Hide Photos option as available on your iPhone or make use of a workaround to truly hide and password protect Photos on your iPhone and iPad. The option to hide photos on iPhone and iPad was first introduced by Apple in iOS 8 and the feature was further improved in iOS 9 by providing users with the option to select and hide multiple photos. 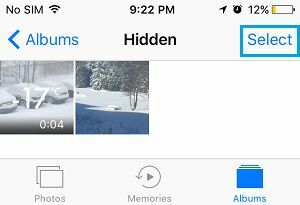 However, the option to Hide Photos as available on iPhone and iPad only hides Photos from Moments, Collections and Years. The Hidden Photos can still be viewed by tapping on All Photos and also by tapping on the Hidden Photos Album. 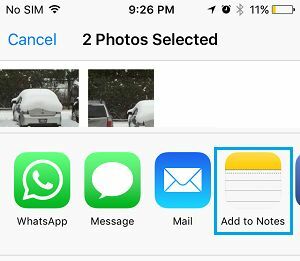 While there is no way in iOS to truly hide photos, there is a workaround using the Notes App that hides Photos and password protects them. We are providing below, both the iOS method to hide photos and also the workaround to truly hide photos on iPhone and iPad. Follow the steps below to hide either single or multiple photos on your iPhone or iPad that you consider as being personal and not to be seen by everyone. 2. Open the Photo Album where the Photos that you want to hide are located on your iPhone. 3. Next, tap on the Select option located at the top right corner of your screen. 6. Next, you will see a pop-up. 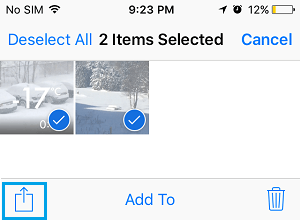 tap on Hide X items to hide the selected Photos on your iPhone. 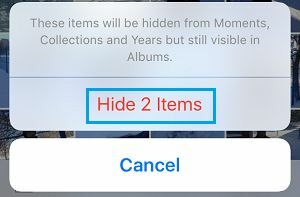 As mentioned above, the photos hidden using the steps above will be hidden from Moments, Collections and Years, but they will still be visible in Albums and also in the Hidden Folder that your iPhone automatically creates in Albums. At any time you can unhide the hidden photos on your iPhone by following the steps below. 3. Once you are in the Hidden Folder, tap on the Select button located at the top right corner of your iPhone. 4. Select the Photos that you want to unhide and tap on the Share icon located at the bottom left corner of your screen (See image below). Now the hidden Photos will become visible in Moments, Collections and Years view of the Photos App. The steps as provided above Hide Photos from Years, Collections and Moments but not from All Photos. This means that anyone who is looking through your photos will still find them by tapping on the Albums tab. While iOS does not provide an option to really Hide Photos on iPhone, there is a workaround that can hide Photos in a Locked Note on your iPhone and no one will be able to access these Photos without entering the Password to unlock Notes. In case you do not know how Locked Notes work, it is recommended that you take a look at: How to Password Protect Notes on iPhone to understand how the feature to Lock Notes works on your iPhone. 6. You will see a pop-up, tap on the Save option to save the selected Photos to the Note. 7. 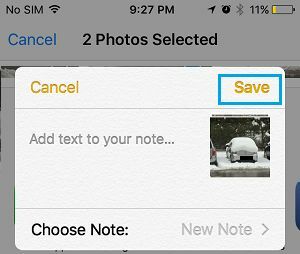 Next, open the Notes app on your iPhone and tap on the Note that has Saved photos in it. 9. On the next screen, tap on Lock Note option to Lock this Note along with the Photos in it. 10. When prompted, enter the Password to Lock this Note and click on OK.
Now the photos that you wanted to hide are truly and securely hidden in a locked note on your iPhone and there is no way to access these hidden Photos without knowing the password for unlocking the Note. 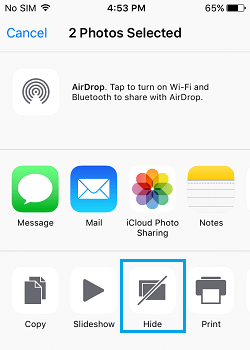 Note: The original copy of hidden photos will still be available in the Photos App. Hence, you will need to Delete the Photos from the Photos App and also delete them from the Recently Deleted Folder. 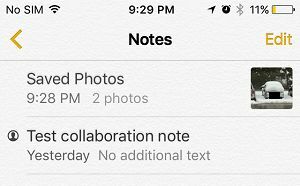 Now, it is only you who will be able to access the Hidden Photos in the Notes App. At any time, you can bring back the hidden Photo to the Photos App by following the steps below. 2. Next, tap on the Note in which the hidden Photo is saved by tapping on it. 3. Since the Note is Locked, you will be prompted to enter a Password to Unlock the Note. 4. Once the Note is open, tap on the Share icon located at the top right corner of your screen. 5. 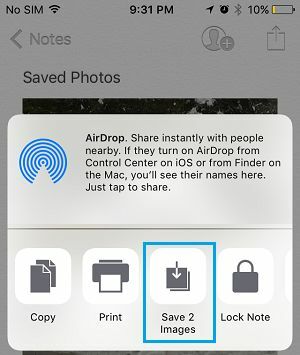 On the next screen, tap on the Save Option to save the Photos in the Note to Photos App. 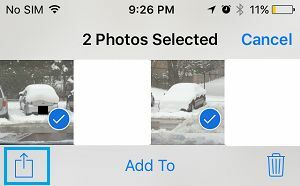 Until a proper option to Password Protect Photos is made available by Apple on your iPhone, you can make use of this workaround to truly hide and password protect hidden photos on your iPhone and iPad.